Today we have made live the holiday site City Breaks Sofia. 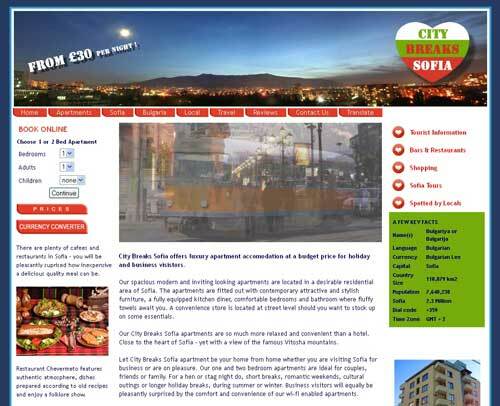 Sofia in Bulgaria is an increasingly popular destination for holiday and business visitors. Sofia is a very pretty 'doable sized' town with lots to offer. from amazing parklands to mountains, perfect for skiing in winter or hiking and general visiting in summer. Our client Peter has 3 large luxury apartments fully kitted out at an amazingly cheap (we don't want to use that word lightly now do we) price - from £30 (yes!) per night. I think I am just going to go soon to check it out for myself and I advise you to take a look at the site to get some idea. Sofia will soon be rivalling places like Budapest and other still relatively undiscovered places in Eastern Europe. Peter has gotten together with a top dental practice and has asked us to design and build a site for that too. Dental 'holidays' now being the in-thing as Eastern European prices are less than half than what our dentists charge. Holidays with a smile he! I should also want to tell you about Luminaires who have a wonderful selection of lighting available from their offices in Douglas, Isle of Man. People have the wrong impression thinking that their lighting solution are outside their budget so Ralph asked us to help them set up a webshop which we did. We chose Powa for them again. We are Powa providers and truly advocate this platform for e-commerce solutions big or small. It is stable, reliable and very reasonably priced. Used by the big boys such as Mothercare, Tesco's and what not. Go to www.Powa.com for more info or contact us if you want have a demo or more information or simply have decided that Redcetera does it for you (the smart thing). Yep, not posted any news for some time again! Shame shame shame. 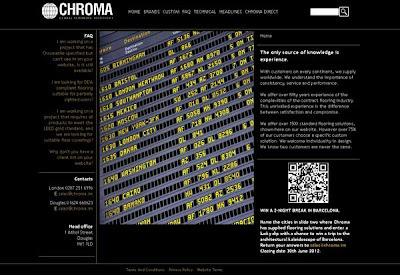 Anyway, a month or so ago we made live the Big make-over for Chroma. Complete change including layout etc etc but above all a complete change from WHITE to BLACK. Refreshing, daring, always ahead of the rest and so very much befitting Michaela and Gerard Jones, proprietors of The Exchange Limited and their company Chroma. As always a pleasure working with you guys and unless I am as bad as usual with my posting there should be news soon on more projects for and with this favourite client.